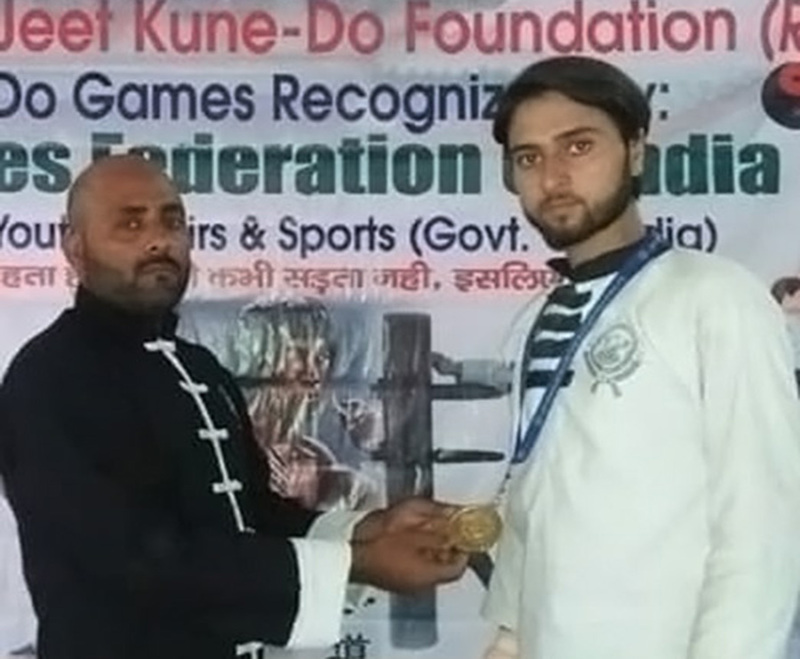 Faheem Rashid Malik 23, a resident of Kalmoona village of Kupwara brought laurels to his state by winning a gold medal in North India Jeet Kune-Do (kung fu) championship that was held at Saharanpur (Uttarakhand). The Jeet Kune-Do competition was organized by Schools Games Federation of India in association with Ministry of Youth Affairs and Sports. “I participated through Uttarakhand Jeet Kune-Do Association Academy that was founded by Fareed Khan, my coach,” Malik said. “He has been my guide, teacher and support. He spends from his own pocket and take me to all the competitions.”Faheem won the gold in the senior category of 55-60 kg weight and was declared best player in the U-24 category in the championship, that had participation from eight states.Jeet Kune–Do, abbreviated JKD, is an electric and hybrid philosophy of martial arts heavily influenced by the personal philosophy and experiences of martial artist Bruce Lee. Lee founded the system on July 9, 1969, and is referred as ‘’non–classical ‘’. JKD is a form of Chinese Kung Fu, yet without form. Unlike more traditional martial arts, JKD is not fixed or patterned.It was named for the Wing Chun concept of interception or attacking while ones opponent is about to attack, the on-line descriptions suggest. “I was interested in martial arts from my childhood, but here in Kashmir I did not found any way to fulfil my aim of becoming the champion of martial arts,” Malik said. Malik did his graduation from Kashmir University and went to Uttarakhand for his Masters. There, he joined DAV (PG ) College, Dehradun, Uttarakhand in sociology. “Two months of joining my college, I Joined Uttarakhand JKD Association which is affiliated with Association of All India JKD Foundation, for training,” Malik said. “I am being rigorously training for last one year,”Faheem said that his family is very supportive. “In spite of difficulties, no one discourages or stops me from playing my favourite game and my childhood aim,” Malik said. “I am addicted to this game now.”‘With a regional gold already in his pocket, Malik is now eyeing for the national championship. He is planning to participate in the national championship slated for September-October in Shimla. For this, he is practising for almost six hours a day. This, he said, is managing while making a fair balance between his studies and passion. Faheem’s family is proud of the achievements of their son. They hope he will, one day, become an international champion. He wants to represent J&K, his home state, in a national level championship.